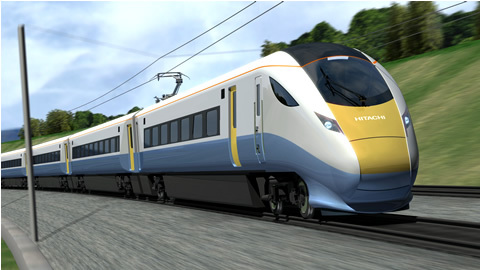 " The British-led Agility Trains consortium, comprising Barclays Private Equity, Hitachi Ltd. (NYSE: HIT / TSE: 6501, "Hitachi") and John Laing, was today announced as the preferred bidder for the UK Department for Transport's Intercity Express Programme. The programme represents a substantial investment in the UK Railway Industry, and Agility Trains is committed to spending 70% of the contract value in the UK. Agility Trains is delighted to confirm that Hitachi and John Laing expect this programme to deliver 2,500 skilled engineering jobs in the UK, in train manufacturing, construction and maintenance. Specifically, the consortium is in active discussions with 20 carefully selected high-quality UK suppliers, which will have a knock-on effect of safeguarding jobs in the UK. In addition this long-term programme will help secure up to 12,500 direct and indirect jobs in the local supply and services industry and local supporting communities.
" The first Japanese bullet train for use on a UK mainline has arrived in Britain, bringing with it promises of shorter journey times. The 140mph (225km/h) six-car Hitachi Class 395 train was delivered on board a ferry to Southampton. The Southeastern train company plans to run 29 of the trains from 2009 on the final section of the Channel Tunnel Rail Link from Kent to central London.